Expositional preaching takes the subject of the biblical text and makes it the subject of the sermon. Most of our sermons are preached in series that take us through entire books of the Bible. I repented and placed my faith in Jesus Christ as my Savior at the age of 9 in 1980. I realized that I have a great need for a Savior because of my sin. Only through the shed blood and resurrection of Jesus could this be accomplished. Praise God for the grace that He gives! It is a gift that only He can give. In my college years, I surrendered to the youth and music ministry. Looking back at my life, I can see how God has sovereignly put me in different places to train me for His work. It is my joy to live out His grace daily and serve a merciful God. Dave Vandergriff has served as Pastor of Music and Media at Keltys since 2017. He was the Pastor of Youth and Music at Keltys from February of 2008 until September of 2017 when he transitioned to his current position. He brings over 20 years of ministry experience. He came to Keltys after over 13 years of ministry in Texarkana, Arkansas. 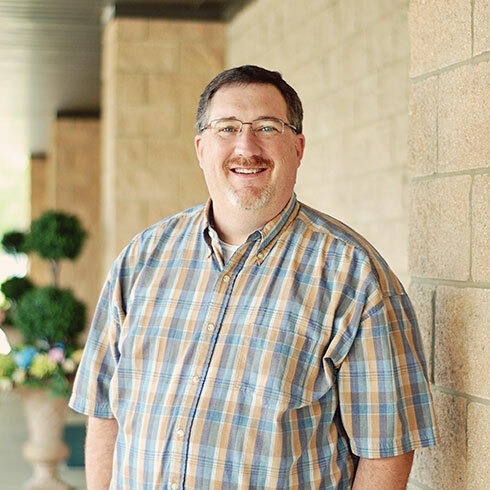 Dave holds a Bachelor of Science in Church Music with a minor in Youth Ministries from Central Baptist College. He recently received his Master of Arts in Church Ministries from The Baptist Missionary Association Theological Seminary in Jacksonville, Texas. Dave and his wife Janie met at Central Baptist College and were married after his graduation in 1994. They are blessed with two children (Katie and Grace). He enjoys time with his family, watching a good movie, playing guitar, and messing with Pastor Mark. "If you confess with your mouth that Jesus is Lord and believe in your heart that God raised him from the dead, you will be saved. For with the heart one believes and is justified, and with the mouth one confesses and is saved."